Let’s start with the good: Dead or Alive slot has a couple of special symbols to look out for, and a round of free spins to give you a headstart. The bad is that it’s all it has - no additional bonus rounds to do some shooting. And there’s certainly nothing ugly about it - the game looks fantastic. You may like NetEnt slots or not, but one thing is inarguable - almost each one of them looks good. This is true for Dead or Alive slot too. Themed as a cartoonish western, it features high-quality graphics, fluid animations, and a couple of bonus features. 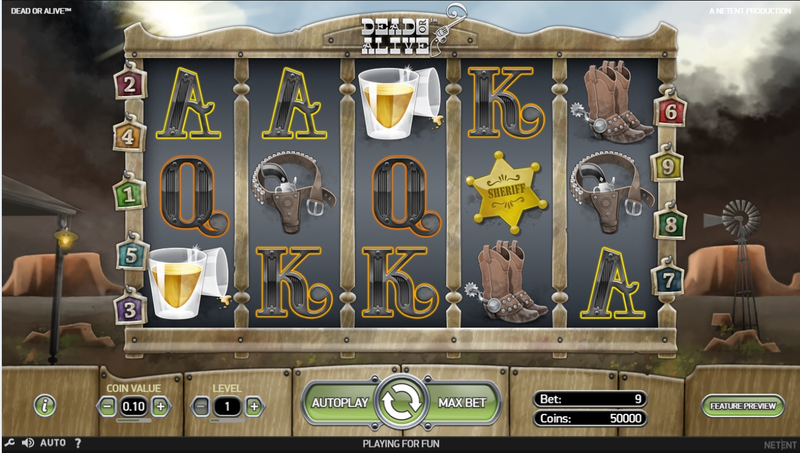 “Just like most other Netent games, Dead or Alive slot look fantastic”. The game looks cool, however the features are not really impressive. You only have a free spins round, and a wild symbol that turns into a sticky wild in the free spins feature. There are two special symbols in the main game. The first one is a ‘Wanted’ poster, that serves as wild, substituting other symbols. The second one is a Scatter (two six-shooters). Three of those activate 12 free spins. During the free spins all the winnings are doubled, but that’s not all. Every wild symbol that appears here turns “sticky” and remains in its place till the end of the free spins session. The features can certainly bring you some nice winnings, if you’re lucky enough, but overall feel slightly underwhelming. The sticky wilds may not even appear. Dead or Alive slot is almost a classic already. While it doesn’t feature numerous bonus rounds, the gameplay is smooth, the graphics are nice, and the free spins are likely to leave you with a bunch of extra coins. Click here to play Dead or Alive, and remember - it’s high noon somewhere in the world.